Vegan Rocky Road Cookies!! These dairy-free delights are chewy, chocolatey, and completely irresistible. Vegan marshmallows and rich macadamia nuts come together to make some of the most delicious cookies I have ever tried. Everyone needs an indulgent snack sometimes. 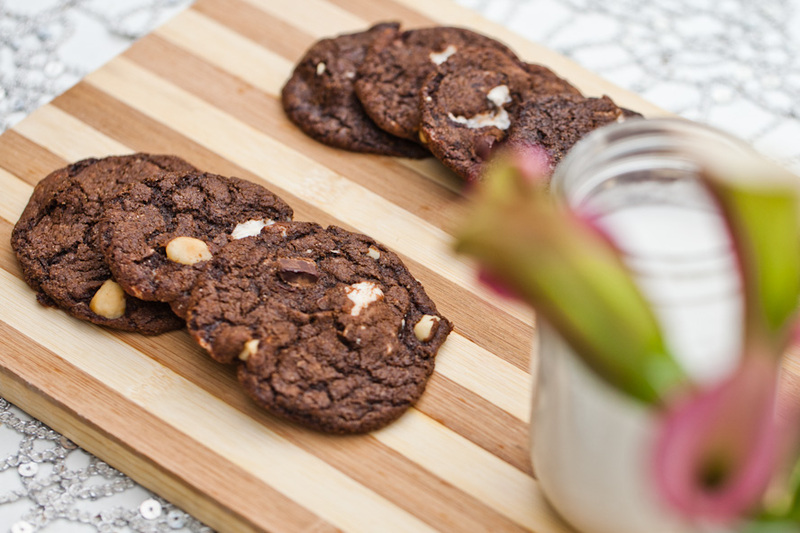 What better way to treat yourself than Vegan Rocky Road cookies and a cold glass of almond milk? I could have made these with whole wheat pastry flour to make them a bit healthier but sometimes you just have to go for it. These Vegan Rocky Road cookies are so delicious, I had to throw a party just to get rid of them. I would have eaten the whole batch! The low-fat vegan police won’t like this recipe, but for those who love a decadent treat every now and then, these cookies are for you! Chewy, chocolatey, and completely irresistible. These vegan rocky road cookies are studded with marshmallows and macadamia nuts. You won't be able to eat just one! Preheat oven to 350°F. Combine the flax seed with the coconut milk to make a flax "egg." Stir well then set aside to thicken. In a medium size bowl, sift together cocoa, flour, baking soda and salt. Cream the sugar and oil with mixer on medium speed. Add the flax "egg" and vanilla. Keep mixing until combined. Reduce speed to low, slowly add the dry ingredients until the dough is formed. If the dough seems too dry or grainy, add 1-2 more Tbsp oil. With your hands, mix in the vegan chocolate chips, macadamia nuts, then finally the vegan marshmallow pieces. Roll dough into 1" balls and flatten them thick into disks about 1½" in diameter. Press the cookies tightly to ensure the dough holds together. Be sure the marshmallow pieces aren't touching each other as this will affect how the cookies bake. Place the Vegan Rocky Road Cookies on an ungreased cookie sheet covered in parchment paper about 1" apart. Bake for 10 minutes. Leave the cookies on the baking sheet for about 5 minutes, then transfer to a cooling rack with a spatula to cool completely. *To make ice cream sandwiches, freeze the cookies for 10 minutes when they are done baking. Spoon very firm vegan chocolate ice cream onto a cookie, then sandwich another cookie on top. The more solid the ice cream is, the easier it will be to work with. Melty ice cream will give you trouble! *Coat the sides in finely chopped vegan chocolate chips, vegan marshmallows, and macadamia nuts. Freeze the ice cream sandwiches for a minimum of one hour to set. For other vegan dessert options, try our Raw Vegan Strawberry Cheesecake or our Raspberry Lemon Layer Cake! To save this recipe for later, pin the photo below! Sign up for email updates & get one 1 free BONUS recipe per month! rocky road is my fav ice cream flavor, so I’m 100% sure I would LOVE these cookies! Will be using my gluten free flour blend to make these! Thank you for a wonderful recipe!